SRI NISARGADATTA MAHARAJ WAS ONE OF THE GREAT sages of modern India. He may be best known for the book of comprehensive dialogues, which was compiled and edited by Maurice Frydman, and published under the name I Am That. While Maharaj was part of a specific lineage he did not propound an ideology or religion. He met with hundreds of visitors from different parts of the world, in a small, unpretentious, upstairs room located in a noisy area of old Mumbai. During these dialogues with visitors, Maharaj’s sole concern was to help the questioner awaken to a direct understanding of his or her true nature. He taught that the mind must recognize and penetrate its own limitations in order to abide in our true, natural state of timeless Being. 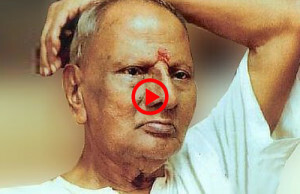 Nisargadatta was a simple man, a householder and shopkeeper. His direct teachings can guide any truth seeker to cut through the powerful mis-identification with the body-mind and shift one’s awareness to the sense of “I Am.” By properly staying with the sense of “I Am,” one can awaken to that which is prior to consciousness.